Congratulations to Claire Fisher Faceup Cymru speech and language therapist! 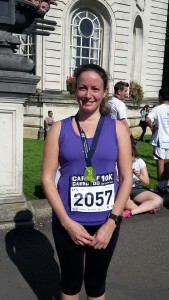 A big congratulations and thank you to Claire Fisher who ran the Cardiff 10K and raised £165 for Faceup Cymru. Claire is a specialist head and neck cancer speech and language therapist, who works with head and neck cancer patients at University Hospital of Wales. Her post has initially been funded by charity money from Faceup.